THE HEAD OF RTÉ News and Current Affairs has said that he is satisfied with the overall €167,000 cost of covering the resignation of Pope Benedict and election of a new Pope earlier this year. The bill for covering the two events was disclosed by Kevin Bakhurst in a speech to the Public Relations Institute of Ireland conference yesterday. Bakhurst said the cost was €100,000 less than the bill for covering the 2005 change of Pope. 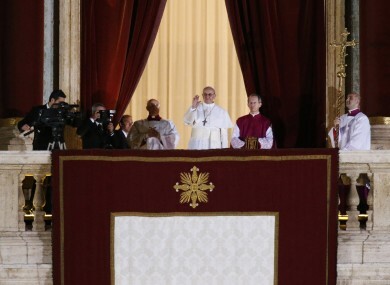 The cost takes in the resignation of Pope Benedict on 11 February, the Papal Conclave on 12 and 13 March and the election of Pope Francis on 13 March as well as his inauguration six days later and covers extended news programmes on television and radio as well as online coverage. The former head of the BBC News Channel said it was “crucial” that RTÉ provided “world-class coverage of major news stories” and particularly of events that have “such a direct impact on Ireland and many of our audience”. Bakhurst said that a third of the figure was used to pay for satellite feeds out of Vatican City and the provision of satellite trucks and engineering. The remainder of the cost was for freelance crewing in Rome, the rental of broadcasting workspace which included live positions for TV and radio as well as flights, hotels and subsistence for RTÉ staff. Email “RTÉ News chief 'satisified' with €167,000 cost of Pope coverage ”. Feedback on “RTÉ News chief 'satisified' with €167,000 cost of Pope coverage ”.